In a large pot, combine vegetables, broth and margarine. Bring mixture to a boil, then reduce heat, cover pot and simmer until vegetables are tender, about 45 minutes. Add meat and continue to simmer for another 15 minutes. Stir in noodles and boil, according to recommended time on package, stirring occasionally. For best results, do not overcook. Mix in bouillon. Yield: One big pot of soup - about 5 quarts. Dig in! I will be in touch with everyone today to provide you with your partners' mailing addresses. I'm getting ready to contact everyone with the names and addresses of their swap partners. NATHALIE, please contact me with your mailing address. I have been unable to rach you. I'll be in touch with everyone soon with your swap partner information. This is going to be fun!!! This is one of my family's favorite recipes. These meatballs are perfect for potlucks, parties and for when you need some stick-to-your-ribs comfort food. They make great leftovers when you don't have time to cook. Serve these over pasta or in meatball subs with crusty bread and mozzarella cheese. Enjoy! In a very large bowl, use hands to thoroughly mix first 6 ingredients together well. Form into desired size meatballs and put into 2 large, deep baking pans. Bake at 375 degrees for one hour. Pour meatballs into large colander, draining grease. Pour two jars of tomato sauce into bottom of each pan (one for each). Place meatballs on top of sauce. Pour remaining tomato sauce over meatballs. Cover pans with foil and bake at 375 degrees until sauce is hot, about 45 minutes. Depending on how large you make these, you will get about 40 large meatballs from this recipe. My parents are coming into town from Arizona tomorrow. I'm so psyched. I haven't seen them since th e summer of 2007. I started my vacation today so I can bake lots of goodies and start cooking up German food for tomorrow's dinner. My mom's family came to the U.S. from Germany in the 1950s', so I was raised with lots of stick-to-your-ribs German food. These days, I make it on special occasions mainly because it's so time consuming to make everything from scratch. While they are here, I want to spoil my parents rotten. I'm going to take them to the popular tourist haunts here in Northwest Arkansas. We're also going to the Beer and Bratwurst fest in the little town of Hermann, Missouri. Hermann is an awesome little town that was established by German settlers way back when. If you haven't been there before and you enjoy homemade food, hundreds of flavors of handmade sausage (after all, this IS a German town), wine tasting, antiques and shopping, you'll want to check out this little town. The small-town ambiance and activities make it the perfect trip for little weekend getaways. The photos here were taken during my last trip to Hermann this past March. Check out all of the homemade cheese and sausage in the photo on the right. When it comes to good food, these people don't mess around. When resin is cast and taken out of its mold, the surface is somewhat dull. In addition, the resin has a tendency to pick up lines and other little flaws from the mold. I have tested many different methods for polishing resin, and some are definitely better than others. I like my resin to shine like glass; if it doesn't, it looks inferior to me. Now, this is just my personal preference. If you are going for a dull finish because you want your resin to emulate granite or stone, that is a whole different issue. I have had mixed results with this product. It tends to be unpredictable and may/may not work depending on several factors including the level of humidity in the air and the temperature outside. (Note: This product really should not be sprayed indoors. The fumes are noxious and good ventilation is needed. I strongly recommend spraying your projects outside.) On mild days when the humidity is low and the temperature is mild (between the 70's and 80's), the product works fine when used as directed. Unfortunately, if the elements don't all fall in line, it can spell disaster for your projects. I found this out the hard way - more than once. In this situation, the spray will come out a cloudy white color, instead of clear. The cloudiness does not go away when the spray dries and the project is ruined at this point. I was able to rescue a couple of pieces by quickly wiping my finger over the sprayed item. (I know - this is a big no-no. Do as I say and not as I do.) Given the fact that I make hundreds of pieces of resin jewelry at any given time, the unreliability of this product is not something I wish to chance. I don't know about you, but the thought of tossing out several pieces of resin that took days to make does not appeal to me in the least. Carnauba wax is an item used to polish automobiles. I read that this item was recommended for polishing resin as it helps to fill in the lines left by the molds, and it leaves a soft shine. When I tried polishing my resin pieces with this product, I really couldn't tell the difference between the coated and uncoated pieces. The lines still showed as clear as day and the resin surface was still dull. Since I like very glossy resin surfaces, this product didn't work for me. It did not give me the end result I was looking for. 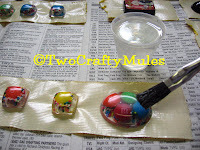 By far, the best results I have encountered is by using resin as a coating for the finished pieces. This takes a little longer as you have to wait for the resin to harden, but the results are well worth it. The finished product is shiny and new, and it's virtually resistant to scratches and wet weather. Hands-down, this is my favorite technique to coat resin pieces. Cut a strip of duck tape (and before anyone emails me about my spelling - the brand I use is called DUCK tape - seriously) and lay it on the work surface, sticky side up. 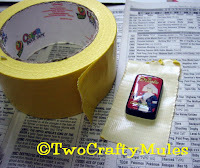 Place the resin piece on top of the tape, face up. Press the back of the tape firmly against the resin piece, using your fingers to ensure there is a tight seal. This step is important. You don't want the resin leaking underneath the tape. In a small container, mix up a batch of resin according to the manufacturer's directions. With a flux brush or other disposable brush, lightly brush a coat of resin over the top and sides of the resin pieces. Use a light hand when doing this; only a light coat is needed to get the glossy shine. Any excess resin will form a pool around the completed pieces and will have to be sanded off after it has hardened. Allow the freshly glazed pieces to dry. Remove from tape. Sand edges as desired and wa-la - you have gorgeous and shiny resin pieces to use in your craft and jewelry projects. Thank you to everyone who entered! I LOVED reading all of your comments about why you love the autumn season. 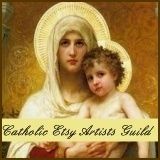 New FLICKR Group to Show Off Your Art From This Blog! What fun is it to make and swap art if you have no place to show it off? I have started a brand-spanking new FLICKR group just for that purpose. 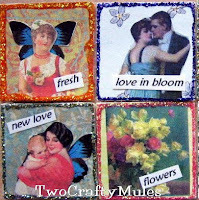 It is called the Two Crafty Mules Altered Art Swap Gallery. This is THE place to post pictures of your art creations made for this group's swaps; you can also post pictures of any artwork you received. I would love for this group to be interactive and to have a great time. If you have any swap ideas, please let us know about it. I hope to "see" you there!!! And way to go, Krista - I received your ATC's today and they are sooooo adorable!!! Sign-ups close on September 6, so if you know of anyone else who would like to participate, please send them over. The more, the merrier! This Month's Giveaway - Jewelry Featuring Candy! Halloween will be upon us before you know it. In order to help celebrate the coming change in season, the beautiful fall colors and the fun of Halloween, this giveaway features "2" handmade resin jewelry pendants which feature candy! The first contains 2 pieces of candy corn - something you will no doubt see a lot of within the next few weeks. 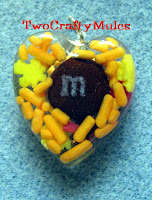 The second features a single M&M set in a candy sprinkles background in fall colors. I've been actively involved on Flickr since early 2007. I initially thought I'd be sharing photos of my designs with other people who have similar interests, but it turned out to be so much more than I'd ever anticipated. I have made many new friends on the site; in addition, I have discovered the "Itty Bitty Book Swaps" through FLICKR and boy, am I hooked. Basically, the swap is limited to 25 or 30 people. A theme is decided, and participants contribute one small page (front and back) for each book. Some participants opted to make all 30 pages from scratch; others, like me, made one original copy of the page, photocopied it, then decorated it with embellishments, glitter and anything else to accentuate the designs. 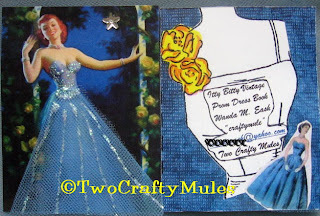 On my page, I used tulle and glitter glue for the dress, and added a little acrylic star to the sky. After the pages are completed, they are sent to the swap hostess, who binds each book, then mails one to each participant. The book pages are small in size but the books themselves end up being really chunky because of all of the embellishments added to the pages. I joined the group when it hosted it's second swap, "Vintage Prom Dress." I am anxiously awaiting the arrival of my book which which should be here any day now. I have also signed up for 3 more swaps through the group - "Sweet Marie" (which is Marie Antoinette/French-themed); "Halloween" and "Vintage Christmas". Halloween is such a fun time of year and I thought it would be a great time to host our first blog swap with a vintage Halloween theme. 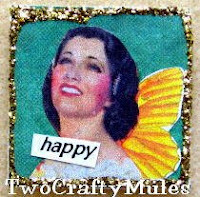 This swap is a 3 for 3 ATC (Altered Trading Card) swap. What is an ATC, you ask? An ATC is a miniature work of art (the size of a playing card) which people swap with one another. The size of the ATC is always 2 1/2" by 3 1/2". It can be decorated in any form or fashion, including painting, decoupage, collage and the like. 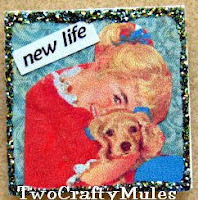 If you have not made an ATC yet, I warn you - it's really addicting. Thankfully, they are inexpensive to make, so you can craft your heart out and not break the bank. 1) This is a 3 for 3 swap. This means you will make 3 ATC's and get 3 ATC's in return. 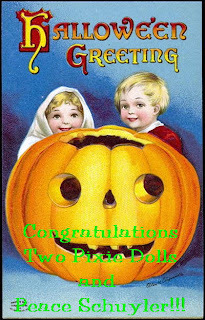 The theme is Vintage Halloween - think witches, ghosts, pumpkins, black cats and anything else that conjures up thoughts of Halloween from days past. 2) Swap sign-ups close on September 6th. If you'd like to participate, please comment here or email me at: craftymule@yahoo.com and I will add you to the list. 3) ATC packages must be in the mail to me by September 30. After all, this is a Halloween swap and it would not be fun if we swapped afterwards. Once I get everyone's packages, I will swap out the ATC's and mail them out to you ASAP. 4) Please include a self-addressed return envelope for your ATC's and include enough money or stamps (if you are in the United States) to cover the cost of shipping. (This shouldn't be too much - $1.50 or so.) Please don't send postage meter strips. The post office doesn't accept these if they are being used to mail a package from a different state. If you live outside of the United States, you can still participate, but instead of sending me stamps, you can send me a payment through Paypal to c over the cost of shipping. 5) That's it! Let the sign-ups begin and have fun! Whoo hoo! I will keep a running list of participates on this post, so please be sure to check back for updates. Tontitown, Arkansas is just a stone's throw away from where I live in Northwest Arkansas. Every year, they hold a Grape Festival which features craft vendors, amusement rides, carnival-style food, used book sale, grape flavored ice cream, homemade spaghetti dinners (made from scratch--no boxed spaghetti, here), grape stomping and live entertainment. Catholic Mass is also held for those who wish to attend. This year, the 110th annual c elebration was no different. Thanksgiving in the little church. They'd sing and dance, and the women served the tastiest meals that their provisions would allow. These little celebrations continued to blossom and every August, without fail, the Grape Festival is held on the grounds of St. Joseph's Catholic Church. With something for everyone, this celebration is one that the locals look forward to attending year after year. My husband and I attended last night's celebration. We started the night off with the delicious homemade spaghetti dinner. Women work for weeks before the celebration making the pasta from scratch and hanging it on racks to dry. Their efforts are very much enjoyed by the locals, and we were no different. Fresh pasta has a taste all it's own. Our dinner came with homemade fried chicken, tossed salad, rolls, butter and a beverage. It was absolutely delicious. Thank goodness I wore my shorts with the stretchy w aistband! Oh, and did I mention? Packages of the dried spaghetti were also for sale for those who wanted to make it at home. I picked up a couple of pounds so my entire family can enjoy it for a yummy dinner to come. While my husband set up our chairs outside the entertainment stage, I checked out the used book sale. The sale boasts all kinds of books, music (in the form of LP's, CD's) and even some puzzles and games. The items cost anywhere from 25 cents to 50 cents so you can stock up on all sorts of goodies and not break the bank. I walked out with 2 bags of books and LP's. Now, in all honesty, the LP's really aren't anything I would listen to, but the kitschy album artwork was just screaming at me. In the near future, I am going to transform them into something cool, like tote bags or clocks. The live entertainment for the night was provided by a local band, Whit Landers and the Hillbilly Connection, and country music singer Bryan White. The stage consists of a large trailer from the back of a semi truck. There's nothing quite like listening to live music under the stars in such a homey atmosphere. 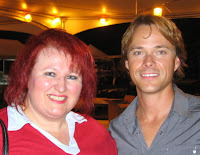 The first time I saw Bryan White in concert was in 1998 in Arizona, when he toured with LeAnn Rimes. The one thing that struck me both times - then and now - is that Bryan really is a nice guy. He's very down-to-earth and just one of the boys. After the show ended, Bryan chatted with fans, posed for pictures and signed autographs. I took the opportunity of slipping him my business card and he promised he would check out my original jewelry designs. I would love the opportunity of making him and/or his wife some personalized jewelry with their little boys images on it. Now, I don't know if I will actually be hearing from Bryan or his wife, but if you don't ask, it's a definite "no", right?